September 1st marks the new 4-H year in Florida, and many families are enrolling their kids this week. 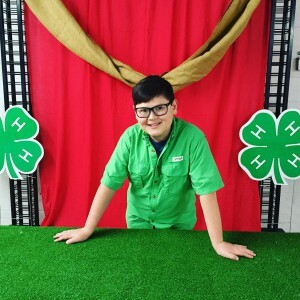 There are several different ways that youth can participate in 4-H. The most traditional delivery mode is community clubs, but youth can also participate through their school or afterschool program, military youth center, camp, or even as a short-term special interest member. Each youth must have a club and project (select from the drop-down menu). You will receive an email with a link to pay the Florida 4-H Membership Fee after enrolling. Pay the Florida 4-H Membership Fee. If you don’t want to pay online, you can drop off cash, check or money order at your local UF IFAS County Extension Office using this form. membership fee is paid, youth cannot attend 4-H club meetings, events or activities. Update contact, medical, club and project information for each member. Each youth must have a club and project (select from the drop down menu). Membership will be set to active after fee is paid. Until membership fee is paid, youth cannot attend 4-H club meetings, events or activities. 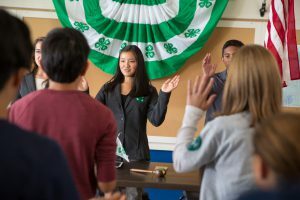 Many counties are planning 4-H kickoffs this time of year, and those events are a great way to learn about the different clubs available in your community. If the fee is a hardship for your family, contact the 4-H agent for possible scholarships. For more information about 4-H, contact your local UF IFAS County Extension Office or visit http://florida4h.org. In addition to serving at the county level, Mrs. McMillian also serves on the Area A 4-H Horse Advisory Committee. 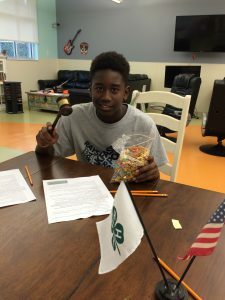 This committee of volunteers provides direction and leadership for 4-H Horse programs across the Florida Panhandle (Northwest District). The purpose of the committee is to make sure that 4-H horse events are educational in nature and adhere to the philosophies and goals of 4-H positive youth development. This committee has the authority and responsibility to manage the direction and resources of the Area A 4-H Horse Program. Examples of programs include schooling shows, showmanship and judging clinics, camps, and competitive shows. 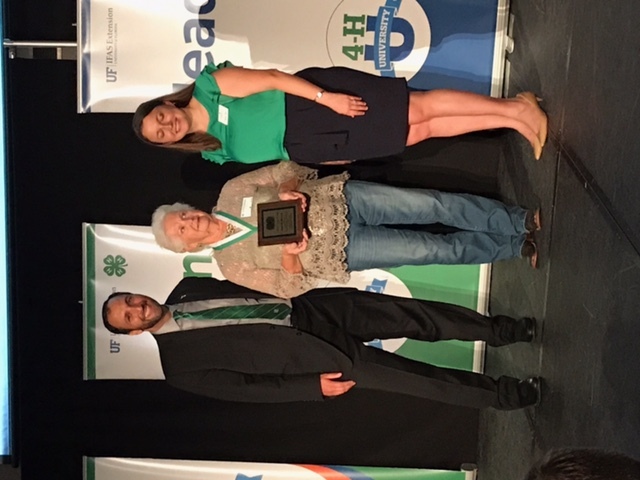 Ms. Jean Bodiford McMillan being inducted into the Florida 4-H Hall of Fame during the 4-H University Awards Banquet in August. Jean has served on the Area A Horse Committee for over 30 years and has held a variety of positions on the committee. 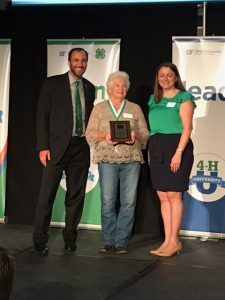 Through her involvement in the committee, she has watched her children, grandchildren, and great-grandchildren participate in the Florida 4-H Horse Program. She is always willing to help with anything that needs to be done from checking bits and helmets to calculating points. She has chaired the Western and Speed Divisions for a number of years at the district level and also pitches in to help with whatever is needed at the State 4-H Horse Show every July. Her work in customer service has helped her as a volunteer to resolve conflict and solve problems. 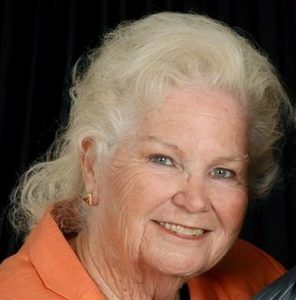 She began her professional career with FairPoint Communications, Inc. (Port St. Joe office) in 1960 in the customer service department and held various jobs over the years. She is also an active member of the Honeyville United Methodist Church in Honeyville located right outside of Wewahitchka. She retired from the integration and reports department of FairPoint in 2009. Despite retiring from the professional world, she has never retired from her 4-H volunteer work. Her dependability and compassion for youth has earned her the respect and admiration of fellow volunteers as well as Extension faculty. If you are interested in sharing your knowledge and skills to inspire the next generation, contact your local UF IFAS County Extension Office to find out more about becoming a volunteer. We offer a wide variety of roles to fit your interests and schedule.